With the help of journalist Brendan Buhler, University of California San Diego (UCSD) researcher and Rob Knight—whom colleagues refer to as a “bioinformatics genius”—has penned an enthusiastic ode to the microbes inhabiting the human body. The book, which is based on Knight’s one-time TED talk, is a short and snappy overview of how microbes affect health. The book has a brief section on how to ‘hack’ your microbiome, with predictions about how we’ll make use of our microbial knowledge in the future. 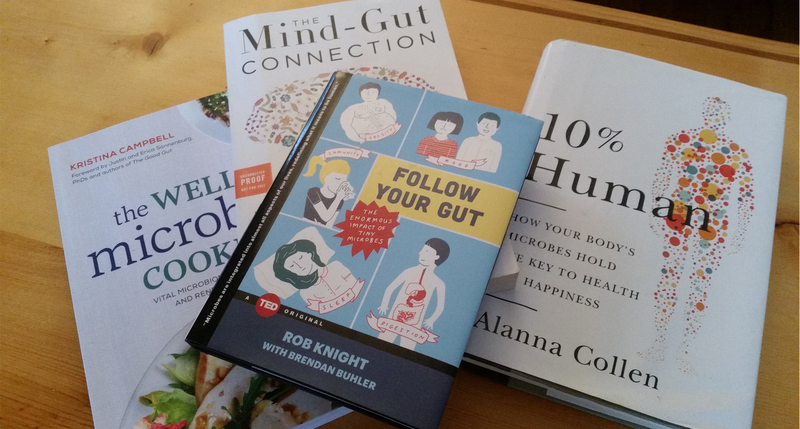 See the GMFH review of Follow Your Gut here. Stanford University scientists Justin and Erica Sonnenburg are the power couple of fibre. Not only is their lab producing some of the most cutting-edge work on how fibre affects health through the gut microbiota, but they have also taken on the task of describing, in their book, how they are putting their knowledge into practice as they raise their two young daughters. The book is a smart summary of current research on diet and gut microbiota, with practical messages that jive with the science. See here for a New York Magazine book review and profile of the Sonnenburg family. Enthusiasm is the finest feature of this international bestseller. Enders, a medical student in Germany, believes the gut is the body’s most underappreciated organ and sets out to showcase its impressively complicated functions in this quirky and engaging book. See here for a New York Times book review and author profile. Science writer Alanna Collen uses her own near-death experience to open this exploration of the gut microbiota’s role in the growing prevalence of chronic diseases. In an engaging and organized way, she outlines the possible reasons why conditions like allergies, autoimmune diseases, digestive issues, brain disorders, and obesity have spiked in the last century—pointing out that in the same period we have embraced a number of practices that negatively affect our microbial communities. See the GMFH review of 10% Human here. In this book, New York University scientist Martin Blaser engagingly details the growing evidence that the overuse of antibiotics is having serious unintended consequences, even beyond the well-known global threat of antibiotic resistance. Blaser puts forward the idea that, while antibiotics are great at killing bacteria when the stakes are high, widespread inappropriate use is causing the extinction of some important bacterial species in the gut, with negative consequences for our long-term health. See the GMFH review of Missing Microbes here. Gastroenterologist and University of California Los Angeles (UCLA) professor of medicine Emeran Mayer always felt something was wrong with the longstanding medical separation of gut and brain symptoms. So he decided to study it. In this book, he takes readers on a journey deep inside the body, from the brain to the gut and back again. He outlines what scientists currently know about the gut-brain axis and how the gut microbiota affects it—through what he calls “microbe-speak”. Mayer also provides measured practical advice for those who want to make the most of their brain health. See the GMFH review of The Mind-Gut Connection here. In one of the first books published on this broad topic, academic-turned-science-communicator Jon Turney gives an overview of the human microbiome in biology. Described in one review as a “terrific romp through our non-human inhabitants”, this engaging book was shortlisted for the Royal Society of Biology book award. In this book, which has a foreword written by Justin & Erica Sonnenburg (authors of The Good Gut, above), science writer Campbell gives a brief introduction to gut microbiome research and provides a practical take on supporting gut health through diet. The cookbook contains more than 150 easy-to-follow recipes. See the GMFH interview with The Well-Fed Microbiome author here. In this book, nutrition professor and gastroenterologist Francisca Joly Gomez explores the intestines, with their complement of microbes, as the “second brain”. An introduction to the complex links between the gastrointestinal tract, the brain, and other organs of the body, the book includes nutritional recommendations and recipes that Gomez says will assist in reclaiming health through diet. In her new publication, chroniqueuse scientifique Desautels-Marissal makes microbiome science both fun and accessible. The book, somewhat like Rob Knight’s Follow your gut in design and tone, provides a quick overview of what microbes do for your body and how you can feed them properly. The book also includes an attractive collection of recipes—with high-fiber and fermented foods—for nourishing the gut microbiome. Professor of immunology Patrice Debré reminds us in this book that a multitude of bacteria live “pour lui et avec lui” and that they require us to re-think the long-held view of microbes as primarily harmful to our health. Debré describes findings that show the intimate connection between the microbiota and the immune system; this wide-ranging book includes detailed descriptions of data and is enriched by observations about general culture and the history of medicine. Two researchers from INSERM (Institut national de la santé et de la recherche médicale, France) give an overview of the human microbiome in this book, detailing how modern societies are increasingly unfriendly toward our microbial partners. In a passionate and engaging way the scientists map out the possible consequences of dysbiosis—and importantly, how to make things better in a world that has become so overwhelmingly hostile to microbes. Gastroenterologist Philippe Godeberge teams up with journalist Caroline Balma-Chaminadour to write this book, which emphasizes how closely our moods and emotions are linked with digestive symptoms. The authors stress the need to understand how the digestive system works; in addition to highlighting the gut’s interface with the immune system, they cover the intestinal microbiota as a key factor in smooth digestion. See here for a podcast that features Dr. Godeberge talking about the book. For a more specialized reading on the gut microbiota you can also check out the GMFH Research & Practice book picks, selected for scientists and health professionals!